30 degree - Our unique plotter blade design enhancement reduces blade drag and improves cutting of small characters and graphics on standard pressure-sensitive materials. For best results, use this plotter blade angle when cutting material with a 2-4 mil thickness. 45 degree - Our unique plotter blade design enhancement reduces blade drag and improves cutting of small characters and graphics on standard pressure-sensitive materials. 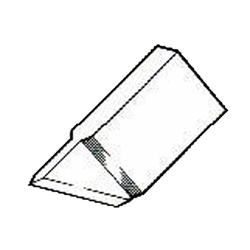 For best results, use this plotter blade angle when cutting material with a 4-12 mil thickness. 60 degree - Our unique plotter blade design enhancement reduces blade drag and improves cutting of small characters and graphics on standard pressure-sensitive materials. For best results, use this plotter blade angle when cutting material with a 12+ mil thickness.